This study aims to investigate the effect of knowledge management orientation (KMO) behaviour on innovation of SMEs in Indonesia. One hundred and fifty-six SMEs in the creative economy sector participated in this study. Multiple regression was used to analyse the data. The statistical results indicated that knowledge absorption and knowledge receptivity are the KMO's dimensions and have a significant effect on the increase of innovation. This finding contributes to both a theoretical and a practical perspective. 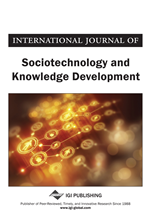 For the theoretical perspective, this study showed that knowledge receptivity and knowledge absorption plays an important role in affecting innovation. From a practical standpoint, this study provides insight of SME practitioners in enhancing the innovation through the improvement of KMO behaviour. Small and medium enterprises (SMEs) are one of the most important sectors supporting the economy of Indonesia. SMEs have a strategic role in national economic development. When economic crisis occurred in Indonesia several years ago, SMEs proved to be more resilient than any other enterprises facing the crisis. SMEs also have important role in relation to distributing the national income of Indonesia. One of the SME sectors that have shown positive growth is the creative economy sector. The creative economy sector is an industrial sector that relies on creativity, and the skills, abilities, and talents of the individuals therein. The development of the creative economy is parallel to the growth of technology and the rapid spread of information (Wiko, 2010). The development of technology and the ease of information access enables businessmen to look for ideas worldwide, which in turn develops a new kind of product and service for the national market. The increasing creative economy sector in Indonesia has a significant effect toward the national income. The Indonesian National Statistics Agency (BPS) revealed that in 2012, the creative economy sector made up 7% of the overall contributions toward national GDP. The Indonesian Agency for Creative Economy (BEKRAF) believes that this number will grow in the future. Today, the creative economy sector in Indonesia is comprised of 16 sub-sectors. Experts explained that the current paradigm is shifting from a resource-based view into a knowledge based-view, thus today, businessmen recognise the importance of knowledge as reference for developing their business. To manage the knowledge possessed by the company, the managers have to apply good management toward the knowledge itself. In having knowledge as a reference to developing a business, a company will set goals based on the knowledge that they possess and will develop behaviour that is oriented toward that knowledge. To conclude, a company that uses knowledge as their reference to develop their business will apply Knowledge Management Orientation (KMO). The creative industries’ main attribute is the creativity of their management. The creativity of an SME’s management is the determinant of their performance (Wang et al., 2008). Theoretically, innovation is a source of sustainable creativity. Prior studies have investigated the determinants of innovation such as organisational learning (Hurley & Hult, 1998), total quality management (Thai Hoang et al., 2006) and knowledge management (Du Plessis, 2007; Gray, 2006). While knowledge management has been recognised as having a strong relationship with innovation, a research gap still exists in the literature. The gap is about the unclear connection between knowledge management and innovation. Many studies put knowledge management as organisational strategy in relation to managing experience. Innovation is the individual’s behaviour in relation to being innovative. Based on these two insights, there is no clear explanation as to how come a strategy taking place from an individual’s mind might affect innovation. To fill in this gap, this study offers knowledge management orientation (KMO) behaviour. KMO behaviour is defined as the orientation of businessmen or managers related to applying knowledge management consistently in their business practice (Han, Kwortnik, and Wang, 2008; Wang, Hult, Ketchen and Ahmed, 2009; Yazhou and Jian, 2013). Based on the study background, the purpose of this study is to test the effect of KMO on innovation. In particular, this study purposes to investigate the four dimensions of KMO (organising memory, knowledge sharing, knowledge absorption, and knowledge receptivity) when associated with innovation. Upon the completion of the research objectives, this study will provide both theoretical and practical contributions. For the theoretical contribution, this study shows the effect of the KMO’s dimensions toward innovation. From a practical standpoint, this study provides an insight for creative economy enterprises to use to enhance their innovation in order to sustain creativity and improve their business performance.